Last year, DreamWorks Animation put out three movies: the prestige picture, the fun picture, and the Shrek sequel. On one hand, MegaMind did not have the emotional resonance of How To Train Your Dragon. On the other hand, HTTYD did not feature Will Ferrell emerging from his own head screaming “Presentation!” while Guns’N’Roses “Welcome to the Jungle” blared on the soundtrack. I’m sensing the beginning of a pattern this year. Kung Fu Panda 2 seemed to be the prestige picture for the year. Puss in Boots is the fun picture, with the Shrek sequel squished into it. Do not go into this movie expecting any kind of emotional resonance or artistic enlightenment. This is not that kind of movie, and was never intended to be. Do go into this movie expecting to be entertained. As pure entertainment, Puss in Boots is worth watching. Also do not go into this movie expecting a lead in to Puss’s involvement in Shrek 2. It feels weird to remember that Puss did not appear in the original Shrek; he’s become such an integral member of the franchise that it seems like he’s always been there. 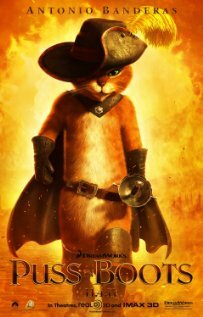 After this movie, however, people may look back and not remember Puss started out as the second annoying talking animal sidekick from the Shrek movies. The story begins with Puss learning that the notorious criminals, Jack and Jill, have come in possession of three magic beans, like those another Jack once traded a cow for. Puss attempts to steal these beans, but fails when a fellow cat burglar, Kitty Softpaws, distracts him. Kitty turns out to be working for one Humpty Alexander Dumpty, who grew up with Puss in an orphanage, dreaming of finding magic beans. Unfortunately, the cat is not exactly on speaking terms with the egg at the moment, but Kitty eventually convinces Puss to join them in stealing the magic beans from Jack and Jill, then stealing the gold egg laying goose from the castle in the clouds. Basically, it’s a heist movie with fairy tale characters. Antonio Banderas returns for his fourth take on the titular character. The movie takes most of its cues from his Latin lover persona. Banderas, no longer playing second fiddle, is obviously having fun. He doesn’t have to worry about stealing the spotlight; this time, the spotlight is on him. The new cat, Kitty Softpaws, despite the cute Bond-girl name, is portrayed as being for real what Puss only sees himself as — minus, at first, Puss’s nobility. Salma Hayek is also having a blast with the part. The third lead, Humpty, is played by Zach Galiafanakis, who seems to be the only cast member who regrets being in the “fun” DreamWorks picture. He appears subdued considering he’s a giant talking egg who has hatched a convoluted scheme involving magic beans. Jack and Jill seem to be the main villains, as it is made clear the other Jack (who makes a odd and funny cameo) has already done away with the giant. Jack, played by Billy Bob Thornton, would like to start a family with Jill (Amy Sedaris), but she prefers a life of villainy. Their byplay, when not trying to kill Puss, is hilarious. Of course, they turn out to be just pawns for the real villain’s schemes, an antagonist who is so obvious the movie plays the reveal for laughs. The movie is best when it is cracking jokes at a rapid pace. It has a few misfires, but they pass quickly. When the action stops to try and give the story more emotional depth, it doesn’t really work. The filmmakers seem to realize this, however. The “deep” stuff comes mostly in a flashback narrated by Puss for Kitty (who appropriately sleeps through it), and near the end. The humor is strong for what many would consider a kid’s movie. However, this review is not for kids, so that’s a plus. Puss is constantly bragging about how great a lover he is; seriously, he never shuts up about it. He is the feline Pepe Le Pew. Kitty even looks similar to Penelope. A furrier source of humor is the constant use of cat jokes. A scene in which Puss laps milk from a shot glass has been in a lot of advertising, and is a good example. It is a great sight gag to begin with, and a good “trailer shot.” Amazingly, it is even funnier in context. The movie contains multiple dancing scenes, like a musical, except, thankfully, no singing. These scenes are amazing to watch, worth the price of admission by themselves, and totally warrant their own subhead. I saw this movie in the middle of the week, when there was less of a crowd. I was shocked by how old the crowd was (only one kid, and multiple audience members old enough to be my grandparents), and how much they really dug this movie. Puss in Boots is just a good time at the movies. I watched a 2D screening, so can’t comment on the 3D implementation. I can guess my comments would have been “meh,” though. I watched Puss In Boots online (link cut) and was blown away! What an amazing film I couldn't imagine what it is actual like in a 3D theatre. Definitely a must see for all people young and old! I'm confused. Is your name Mikey or Jerry? Or Cindi? Keep your promotional stuff off the site, thanks. Don't follow the link, folks. Mister Twister, I am disappoint.